April 27, 2017 | -by: Guest Writer. Email marketing automation might sound like an IT factory suitable only for large corporations with tens or hundreds of employees moving like well-oiled cogs. If this was ever true, things have changed. Email automation is now affordable and accessible to small and medium-sized businesses from various industries. In fact, email marketing automation is a must if you want your campaigns to be opened and clicked more often and produce more revenue than standard marketing emails. How does automation accomplish this? By helping marketers send personalized, timely and hyper-relevant messages to their audiences. Automated email series are the opposite of mass-produced emails that are created for a whole list of subscribers and sent in one go. 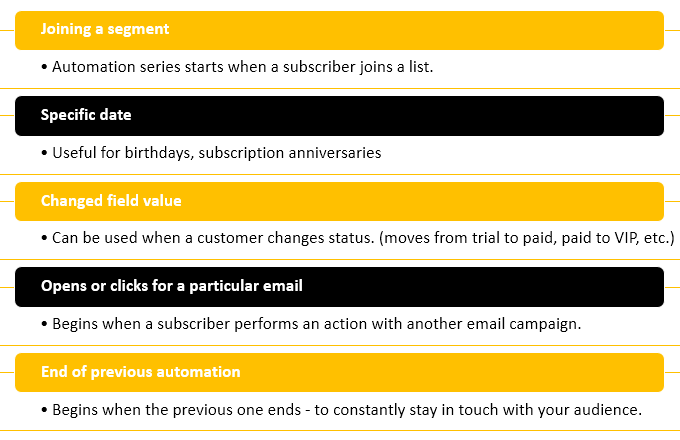 With automation, you set up an email or series of emails that are automatically sent out when subscriber meets a pre-defined trigger. “Email automation can be time-based or behavior-based”. Time-based automation is rather straightforward – basically, it’s a system of autoresponders set to go out based on date, time or delay you determine. However, if you are aiming high, you should go for behavior-based (or action-based) automation as it gives you numerous personalization opportunities. For example, you can approach your customer when they open an email or click on a particular link, and much more. The complexity of creating automation series can vary – from a simple “welcome” email to campaigns that target visitors after they’ve completed a particular set of actions. What Benefits Can Email Automation Bring To Your Business? First, choose an email marketing software provider that offers behavior-based automation suitable to your business needs. Then have a serious look at your sign-up form, because that’s where email marketing automation starts. Be it online or offline, make sure to gather enough information about your customer. 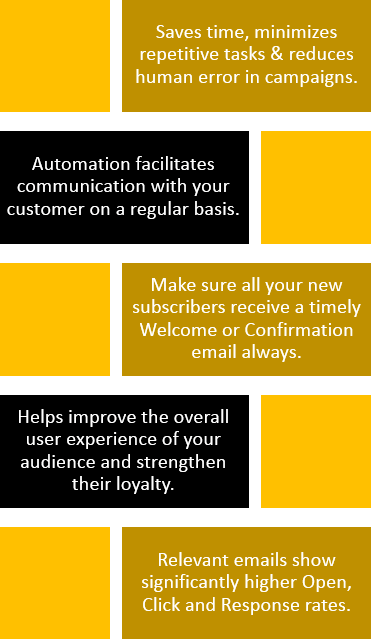 For some automation series, it’s enough to know the subscriber’s email address while others require more detailed information. You can include relevant fields – like date of birth, gender, and city – in the sign-up form. It’s important to ask only the most necessary data because people don’t like to fill out too many fields. You can also include a short survey and ask your subscribers to tick boxes and give more specific information about themselves or their habits in the context of your product/service. In this example, online store Doggy Loot is doing a survey right after the signup to send more targeted content and offers later on. Not only they are asking for the size of your dog, but also the postal code that can be helpful when crafting offers based on location. You can also offer something exciting in exchange for signing up to your service. Logojoy – an online service for designing logos – asks for your email before letting you save the logo you just made. Tempting, isn’t it? Then decide how to segment your audience based on the data you have – age, gender, address, subscription date, loyalty status, purchase behavior or any other information. Think about the segments that will help you reach your marketing goals. Remember – each segment is a powerful forum that lets you steer the relationship with your customer in the right direction. Welcome series. 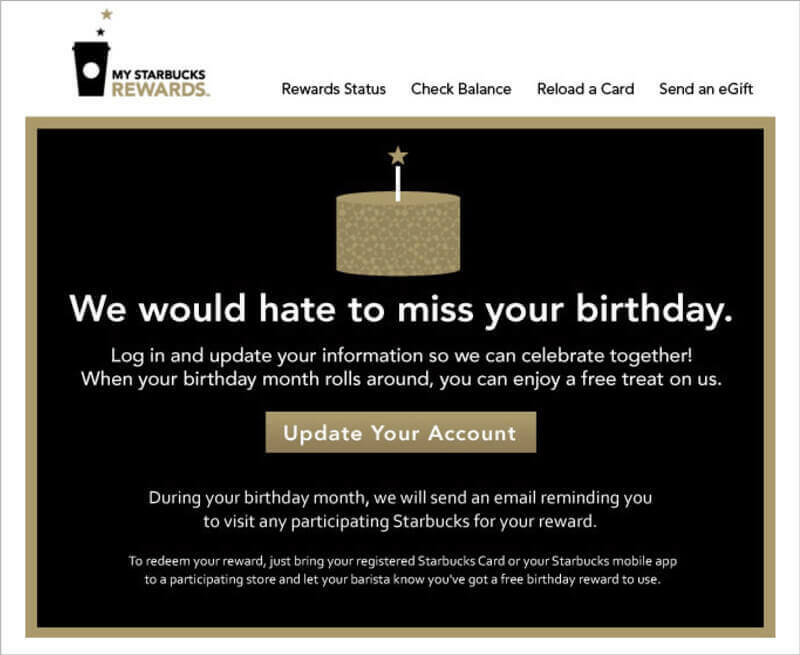 Keep your customers’ engagement high right upon the sign-up. You can use a single email or an onboarding series. Thank them for subscribing and tell them what to expect. 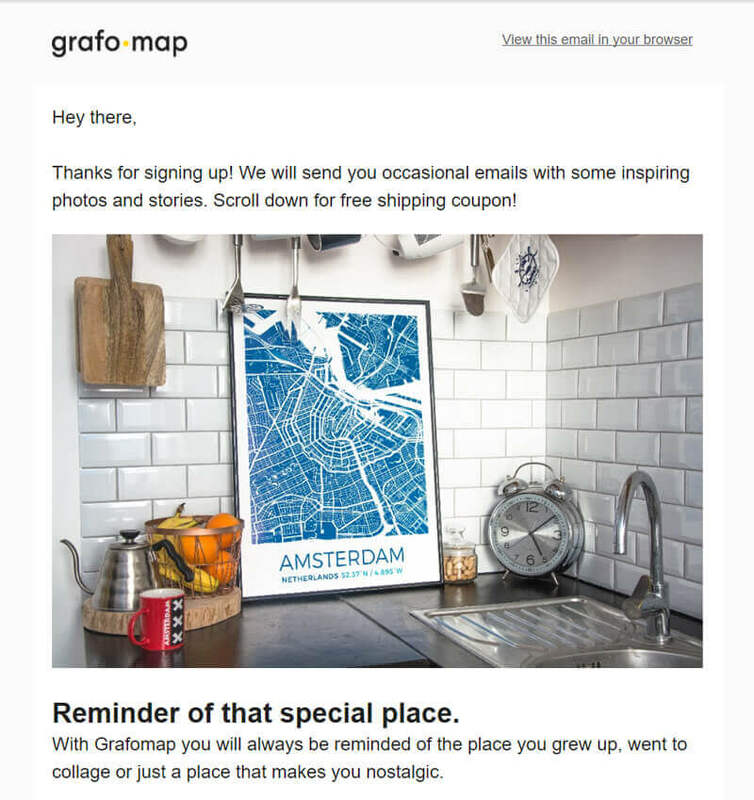 Grafomap, a tool for designing personalized map posters, does several good things in this email – thanks the subscriber for signing up, explains what to expect from their newsletter, showcases a beautiful way to use their product and offers a free shipping coupon. Thank you emails. 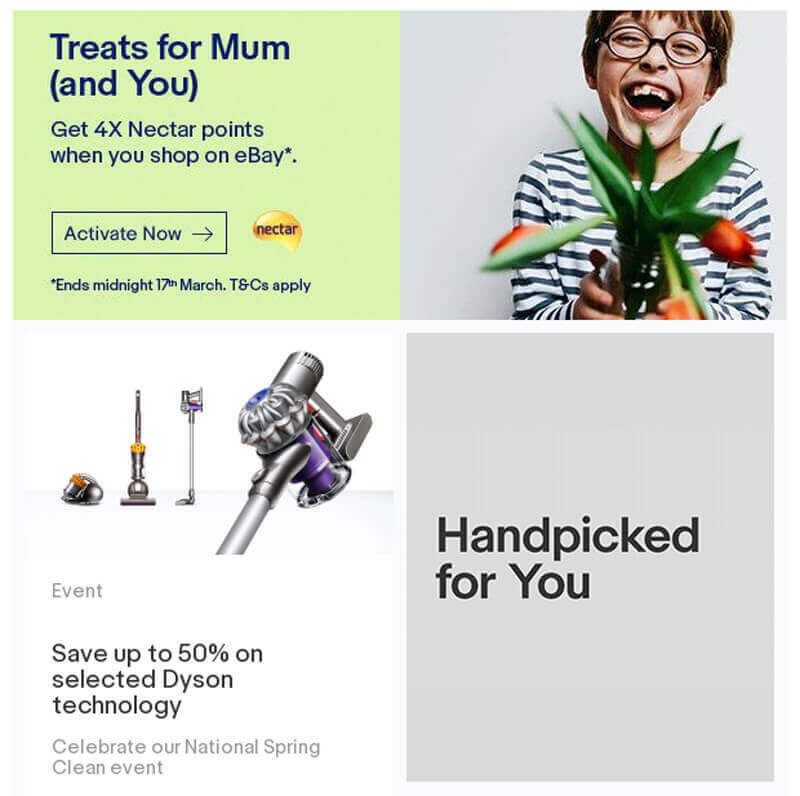 Every time a customer makes a purchase, signs up for your special offer or performs another action you asked them to, send an automated email to tell them you appreciate it. Simply say thanks or add a special bonus that will make your customer even happier. Educational emails. Send your customers valuable content, practical advice or teach them how to use your website to find the best deals. See how Typeform are onboarding their newcomers with a simple, friendly and informative email. 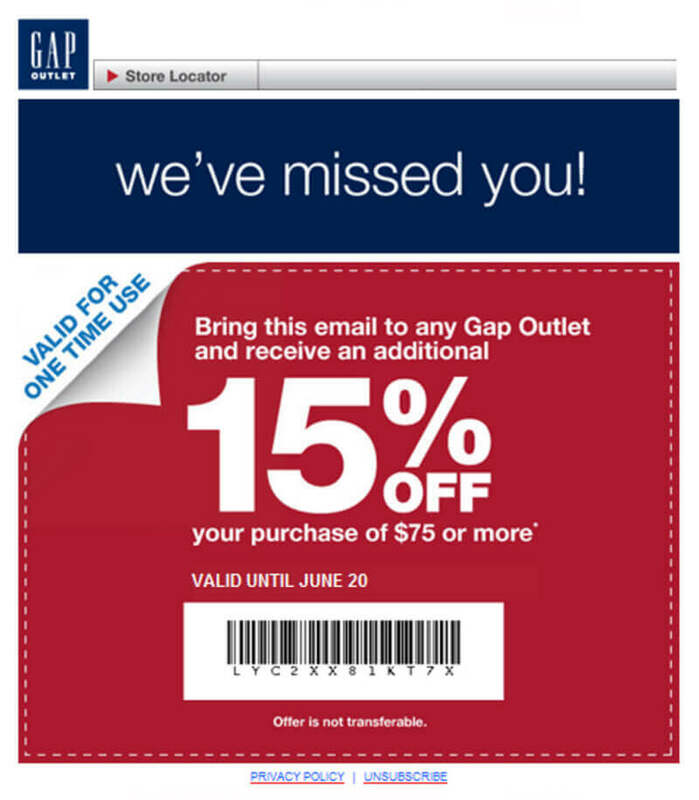 Upselling emails. Base your offers on each customer’s purchase history to craft super targeted messages. Here Dollar Shave Club reminds about an upcoming shipment and also upsells other products that you can add to your delivery. Email marketing automation helps you target a customer in the critical moments of their life-cycle with a message that influences them towards the action we want them to take. Automation also lets you easily organize your contacts and segment lists to focus on clients who are generating sales for your business. This helps your sales team prioritize and reach out to the hot leads faster. Acquiring new customers can be a very tough and expensive process. In fact, it is much easier and even 8 times cheaper to make an existing customer purchase more. 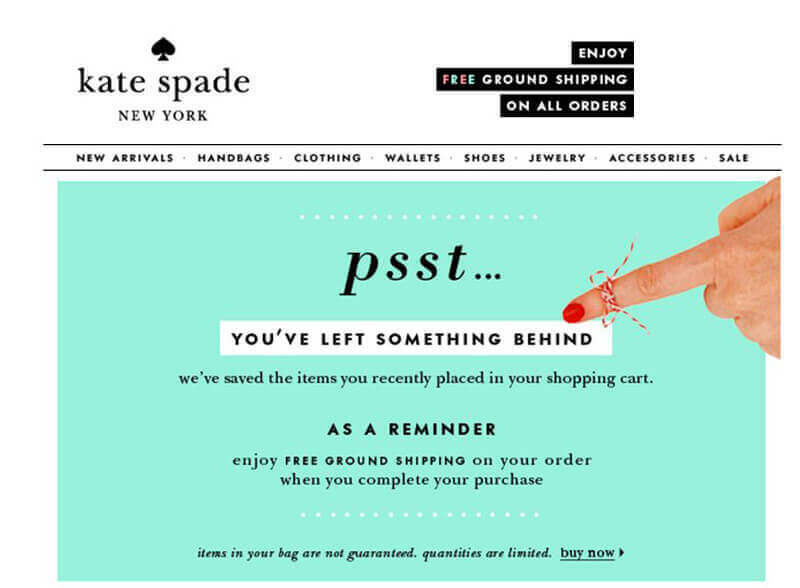 Create a series of emails for subscribers who have just made their first purchase. Emailing them soon after would increase your chances of building a long-lasting relationship. You can simply thank them and inform them about new arrivals, suggest to buy related products or offer a 10% off their next purchase. You can also send an additional special offer to those subscribers who didn’t open the first email. In this case, make sure you show the bonus already in the subject line. 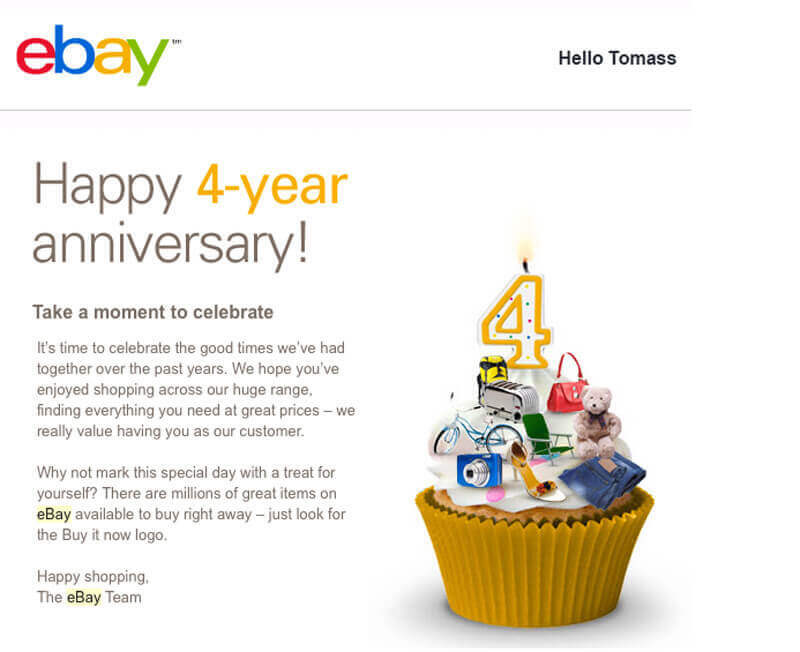 Start sending Birthday greetings or celebrate subscription anniversaries. This will build a positive image of your brand and make your customers feel more attached to your online store. 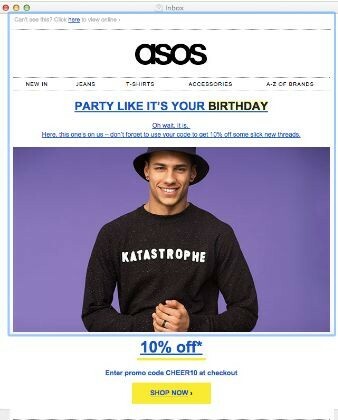 Asos is sending a branded greeting and offering 10% off the next purchase – a small step for the company, but a great loyalty enhancer for the customer. You can leverage geo-location and other customer data to craft personal and relevant emails. For example, if you have an e-store, you can segment customers by city and offer free delivery. 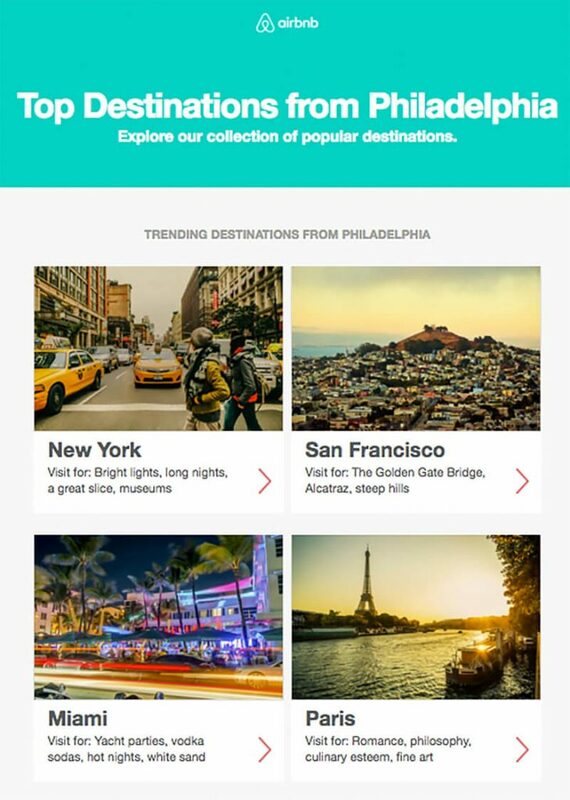 This example shows how Airbnb are a targeting people according to their home town. Studies show that on average 74% online shopping sessions are not completed. Reasons may vary, but the most common ones are shipping and administration fees. Set an automated email to address those who abandoned their shopping carts and give them a small discount or free delivery. Email marketing automation allows you to impact your customers’ decisions along all stages of their lifecycle. This tactic works very well in the B2B sector. 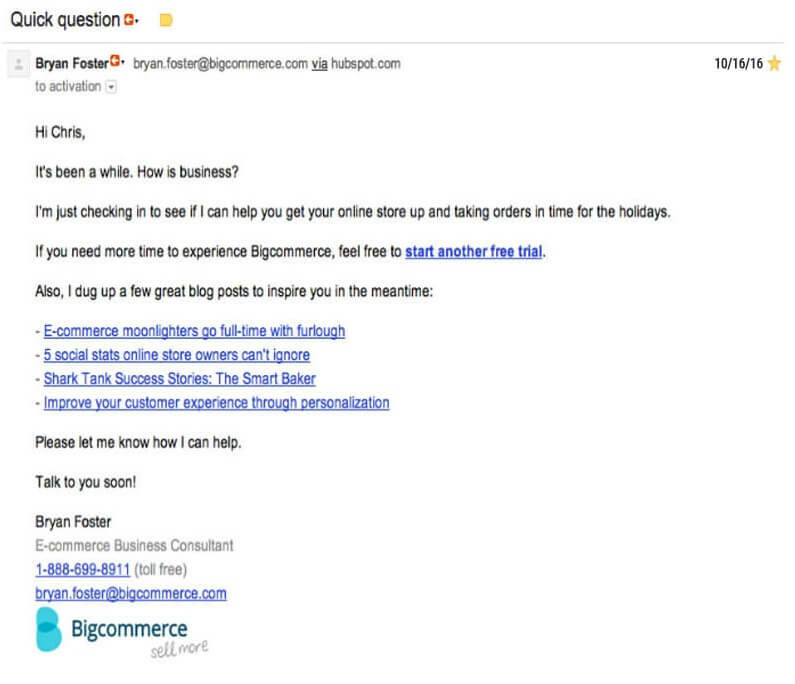 This example by Bigcommerce shows the use of personalization, product lifecycle data and previous purchasing history in order to craft a highly targeted email that seems to be written by a friendly business partner. Every successful automation series starts with a clear plan and goal that you are trying to reach with this communication. Do you want to onboard new subscribers? Convert leads into customers? Or win back inactive subscribers? Segment your audience carefully based on the information you have – gender, location, subscription date, loyalty status, purchase history, etc. Alternatively, you can import the client data from your CRM tool or e-commerce platform. Some email providers directly integrate with different CRM systems. Once the data is brought into your email marketing system, you can use it to send triggered email series. Some email automation platforms offer more sophisticated triggers, like visiting a landing page or performing an action on Social media. However, the above mentioned categories should cover all the basic email automation needs. Once you have picked the trigger, you can choose settings for your campaign – like days of the week and time when emails will be sent. Some providers let you adjust the sending to a recipient’s time zone, which is very important if you have customers in different countries. Afterwards you can start building your email automation series by adding emails, templates, conditions and time delays. Conditions or if splits are based on the opens or clicks from the previous campaign. Email builders vary significantly so make sure you chose an intuitive platform with many functions and a friendly UI. Email marketing is an integral part of inbound marketing strategy that requires a long-term approach and brings results in the long run. Calculating your email marketing ROI is a must if you want to know how successful your email marketing campaigns are and improve your results. Automation also takes you to the next level of email analytics by bringing you detailed and visual stats about each email and interaction. It also gives you more flexibility to manage data and react to it in real-time. For example, you can see which emails get more opens and clicks and make changes if needed. If your account integrates with Google Analytics, you can automatically see where your e-store visitors come from and learn their purchase behavior. Analytics will also show you what kind of content attracts people to your store and what convinces them to buy. Email marketing automation saves time and money and brings visible results. Therefore automation expenses should be seen more as an investment than a cost. Most email automation software providers charge monthly, and the price depends on the number of subscribers in your database. When you compare email marketing automation costs to those associated with sending emails and nurturing your leads manually, automation campaigns can save you labor, content and design costs, and much more. Congratulations – you have completed the beginner’s course in email marketing automation! Now you should be able to choose the most suitable campaigns and setup automated email series. Send us your feedback and comments below. Awesome article, Kevin! A very detailed explanation about email marketing automation. This will help a lot of businesses. I will be glad to share this with my friends. 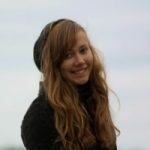 Amazing blog it was helpful for me. Thanks for the post. Thanks for the tips and examples. It’s really useful! I’m considering starting using email marketing or marketing automation. It doesn’t seem so daunting anymore. I’m considering GetResponse’s solution right now. Do you know it?